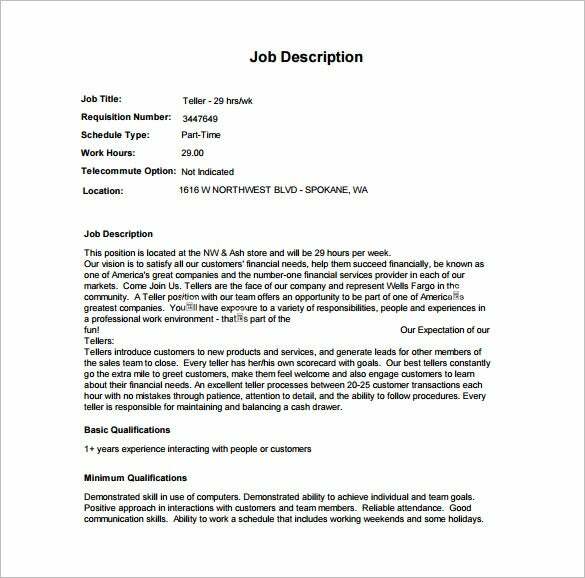 hrs.wsu.edu | The Wells Fargo Bank Teller Job Description PDF Free Download is a simple yet useful template for all those who are wanting to develop hassle-free job description brochures. It can clearly indicate the targeted audience and along with all the requisites for applying for the posts on board. 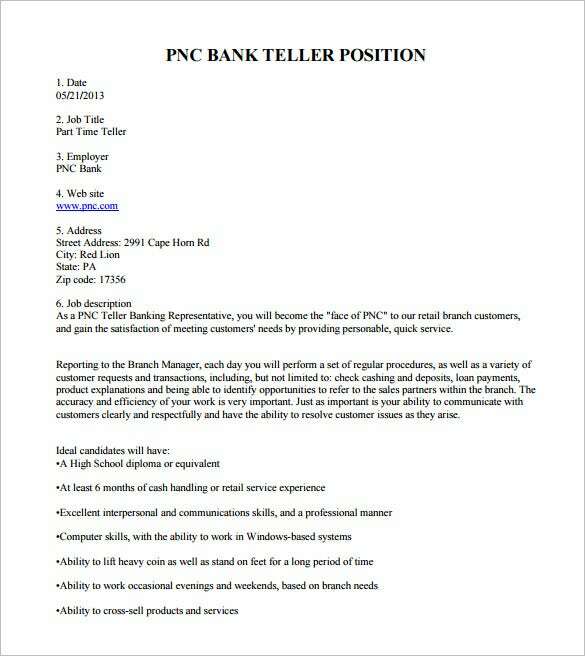 dallastown.net | The PNC Bank Teller Job Description Free PDF Template is a very well organised template which is very useful for banks seeking candidates for the post of bank teller. This template showcases the qualifications which the applicants must adhere to in order to apply for this post. This template in PDF format also reflects all the details about the job. 1stmanatee.com | The Senior Bank Teller Job Description PDF Free Download is a template which is ideal for creating job description outlays. This template can be easily downloaded in PDF format. The role of the post as well as the candidate’s responsibility are clearly mentioned which makes it easy for the applicants to understand his/her work better. 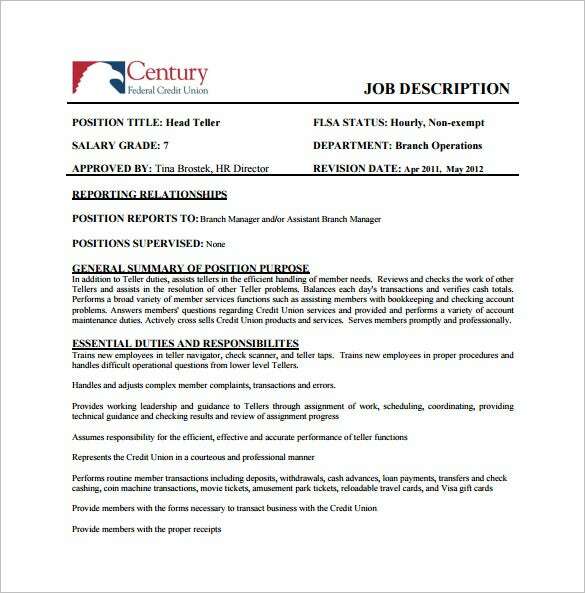 cenfedcu.org | The Free Head Bank Teller Job Description PDF Template Download is a well organised template giving a detailed preview of all the details required for applying for the post. Along with this, the template also shows other job related descriptions. 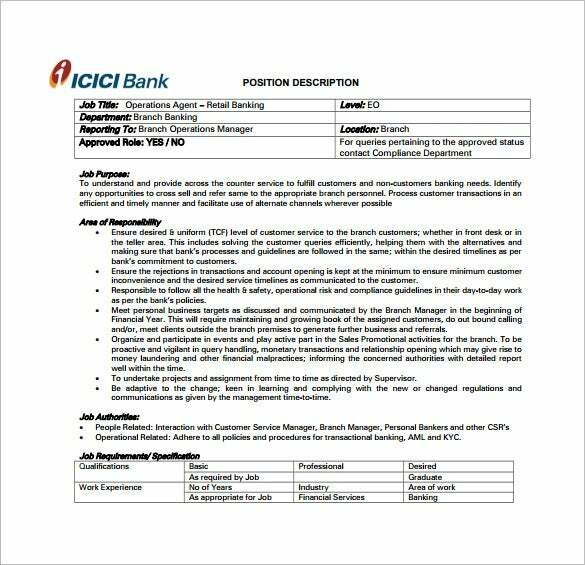 This template is ideal for all banks seeking candidates for their required posts. How Are These Templates Useful? 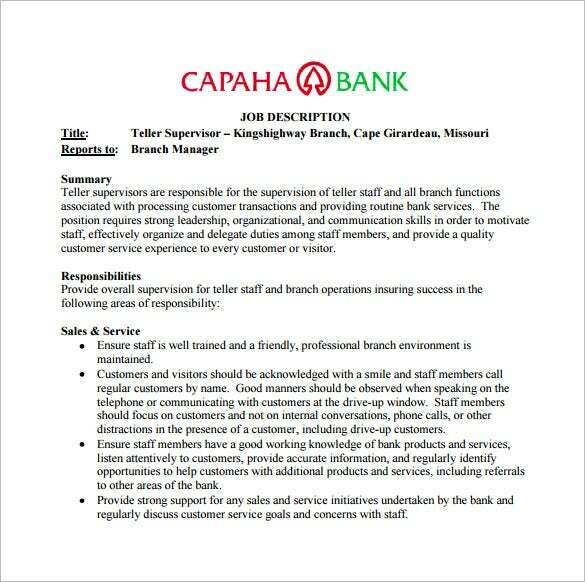 These Bank Teller Job Description templates are not just useful but highly beneficial. These templates are developed so that user can be provided with the right kind of guidelines which help to construct suitable job descriptions. These templates also help the users to keep an account of the desirable features which are required to be incorporated into the job description.These bank teller job templates are also helpful in exceeding the speed of work since the format in which it is developed is highly accurate. Their accuracy helps to create a large number of such descriptions in no time. Who Are the Ones to Extract the Benefit of These Templates? 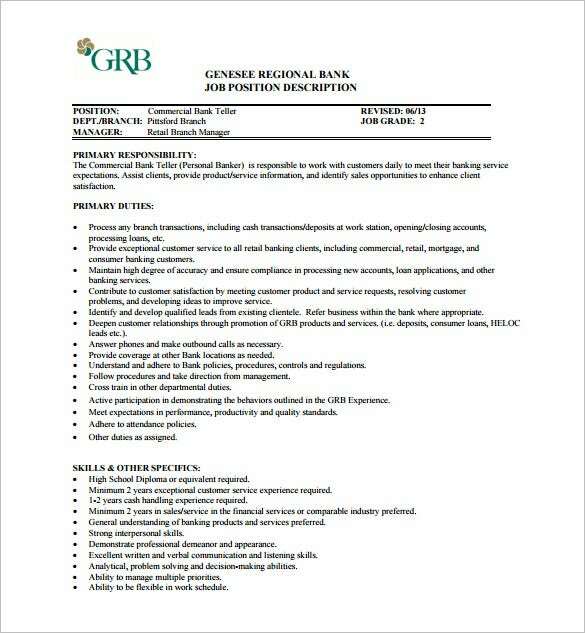 The purpose of these bank teller job description template is to display all the potentials required by the desired applicants in order to enter the arena of a bank teller. These templates are also focussed at showcasing a detailed account on the very job that is on stake. These templates are more than beneficial to the banks and commercial firms which have an alliance with the financial institutions. 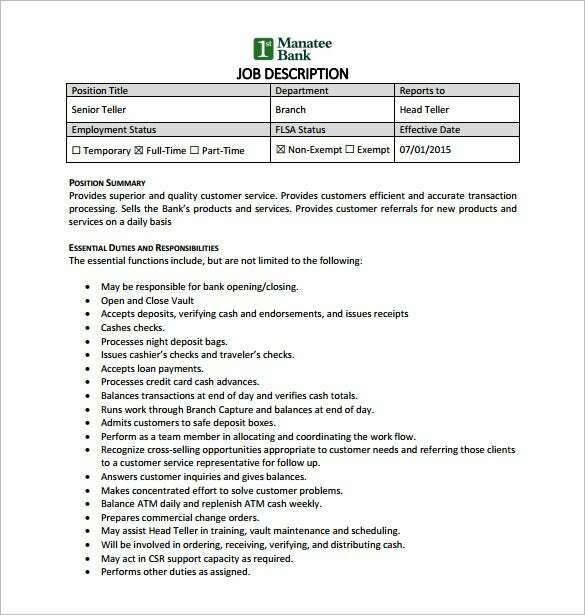 These templates save a lot of time of the workers who are engaged in preparing such bank teller job descriptions. These templates can be instantaneously converted into required descriptions as they are available in several user friendly formats. The benefit of the bank teller job description templates is enormous and this has helped them to gain a large amount of popularity. These templates are easy and convenient to make use of. Other than the friendly manner in which it works, it is also packed with features like cross browsing, Google Web Fonts, Tag Cloud, Zoom Cloud, Favicon and several other such functions. These templates are available in Word and PDF format which invariably helps the users achieve their target easily and effortlessly. These templates are also easy to edit in accordance to one’s requirements using software like Adobe Photoshop CS+.